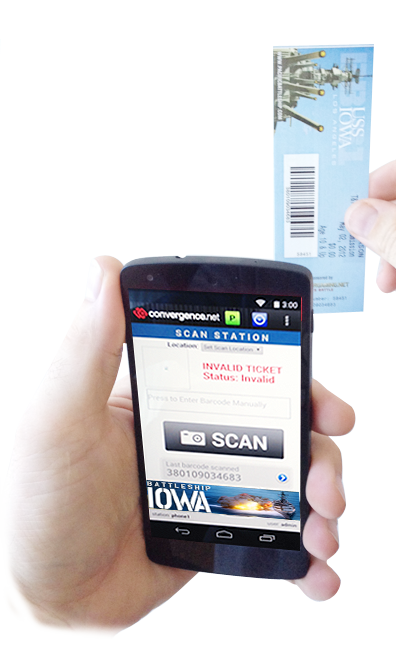 Convergence redemption capability gives clients the ability to scan barcoded tickets (whether paper ticket, wristband, or eTicket displayed on mobile phones) or barcoded memberships (whether cards or displayed on mobile phone). With our emphasis on mobile ticketing, all of our scanning solutions are capable of scanning barcodes or QR codes that are displayed on guest cellphones. Tickets may be conveniently redeemed at POS stations, access control stations at attraction entrances, inside the park at shows or events, or at merchandise or food pickup locations. Our scanning capability doesn’t just beep a yes or no admittance. We give visual cues as to validity of date, time, or day of week. We also display order information and information about the particular ticket or pass. With our multi-scan group tickets, attendants enter the number of quests they are admitting. With membership card scanning, attendants may easily enter the number of child and adult guests and the scanning display may show a image of the person or family and show any special alert messages for that membership. Redemption stations may be assigned to a ‘location’ which is recorded in the redemption database. Certain entitlements may be tied to a particular location for easy membership entitlement redemption. Convergence has an excellent scanning app called ScanStation which runs on selected Android handheld computers with high performance imagers. Current devices include those from Zebra and Unitech; however, new models are introduced regularly and our recommended list for handheld wireless scanners is updated biannually. We support the same scanning and redemption capabilities, whether from a USB connected scanner to a notebook computer, from our ScanStation handhelds, or from a Bluetooth-connected wireless scanner connected to a tablet. This gives a great range of operational flexibility at a variety of price points and clients may deploy a combination of these technologies.